The OECD reports that voting rates are falling in member nations and shows that turnout for the last UK general election, at only 61%, was well below the OECD average of 70%. A House of Commons Library note describes ‘a large decrease in reported membership of UK political parties over the post-war period’ and how, since 1983, the proportion of the population who are members of political parties has fallen from 3.8% to 1%. Trust in governments is low: a Guardian/ICM poll found that ‘European citizens do not trust their governments’ and, according to Democratic Audit, only 55% in the UK feel that ‘people like them’ could ‘change the way the UK is run’ if they were to get involved in politics. Yet, as formal participation in politics falls and a sense of disempowerment becomes rife, political leaders talk up democracy and their own democratic credentials. The gap between what people hear from politicians and what people feel about politicians is a problem. It is a problem for government, and all centre-ground political parties, but is a particular problem for the centre-left: it leaves a gap for a populism that is not progressive. The last Labour administrations felt and tried to address this problem. ‘Democratic renewal’ was a powerful and recurring idea for Labour in government. It was a phrase that it attached to many of its reforms of government. Why, then, does disaffection and its symptoms remain? Partly due to the actions of the present coalition government, of course, but given the long term trend, the malaise also runs deeper than that. Previous research I’ve carried out (see here and here) reveals important absences in the way that professional politicians tend to describe democracy. Very often democracy is spoken or written about with no reference to ‘the people’ (or any similar phrase) and so fails to acknowledge that democracy is about those groups which are beyond government and are without formal power. It follows that there is also an absence of any recognition that democracy is a specific type of relation between government and the people: one in which the powerless ‘bite back’ at those with formal power and that when they do so they do it with good cause. Conversely, professional political use of the term has tended to see ‘democracy’ as taking place only within the institutions of Westminster and as being a property of government rather than something to which government might be subject. Holding this view, even when attempting to renew democracy, makes deep rooted reform improbable. Labour could change this but in order to do so it must not fall for those prevailing ideas about democracy which have undermined it. It must recognise that government and democracy are not the same thing as each other. A distinction between the legitimate, mandated, business of government on the one hand and the potential for democratic action from beyond government means two things for a party in government. First, it means that the business of a party in government must be founded on the values of the party, values which resonate with its broader constituency. It must defend those values and the policies for which it has a mandate and it must resist the lobbying and conniving of opposing vested interests. It also means, though, that when it gets decisions wrong – and no government can be right always – it must find ways of being open to democracy. This can be done not by trying to change democracy – democracy is beyond government – but by changing the practice of government to actively seek out, listen to, and engage with the objections and arguments formulated amongst the powerless. And when those objections and arguments are sound, the party in government must act accordingly. I agree with most of this but we need to acknowledge that turnout collapsed during the New Labour era. The turnout in 1992 was high partly because there was a reasonable choice for voters. Labour had moved away from the hard left but it was still a recognisably left of centre party. The election in 2010 was strange because the turnout increased slightly and the Lib Dems seemed to be the left of centre party. They then decided to go into coalition with the Conservatives! This left a gap on the centre-left that has been filled by Labour to some extent. It will be interesting to see what happens to turnout in 2015. Of course, our awful voting system is the elephant in the room when turnout is discussed! This is, unfortunately, a very dangerous thing. The more disenfranchised people get with the voting system, and the parties, the more right-wing parties like UKIP will gain voters, and I can’t really imagine anything worse than that happening. The public perceive little difference between the parties. Politicians appear to sit in a very narrow band of what is possible or desirable. They don’t reference the wishes of the voters, they are professional politicians. Whoever you vote for, the government always gets in. France has a ‘left wing’ president, who campaigned on left wing policies. But of course as a member of the EU (and the eurozone), France is powerless to implement many of the promises – these were carefully worded but gave impressions to the electorate of intended action. Instead, he simply implements the agenda of the superior layer of government without proper explanation. When, over a period of 20 years, politicians of the old parties appear to do the opposite of what they promise, and are not frank that they themselves do not make certain decisions, it brings the whole political class into disrepute. It suddenly becomes obvious that the failure to deliver is cynical and not some sort of ‘accident’. It is all very well referring to alternatives as ‘populist’ but that is how the elite used to describe socialists, and how anyone today who does not wish to introduce popular policies describes those who do. If a government just wishes to be elected all the while knowing its promises are fraudulent and cannot/will not be implemented (‘just shut up and vote’). then it is surely a surprise that turnout even hits 50%. That is the reason in the UK for the growth of both UKIP and indeed to some degree the Green Party. The answer is for governments to act on what they actually believe in, or what they say they do – not cynically campaign for one thing, knowing they will not implement it. Their only hope at the moment is to rely to friends in the media to just make non-political and personalised attacks on new opponents in the hope that slur and smear will cow the electorate into submission and not vote for alternatives. It seems worse to be governed by lying smear campaigners with no real policies than by new parties which might do something better. Otherwise, the only choice left is, indeed, UKIP or Green. Who wants to vote for those main three parties once you know they are simply holding out a fraudulent prospectus – a kind of purposefully fuzzy mess all similar to each others? We have a Labour council in my city, they never let a minute go by decrying the awful austerity being imposed upon its residents, but it has created a massive bureaucratic empire that includes a number of CEOs and Directors, complete with large departments and huge salaries. Nobody in the city is consulted on this issue. And you can scale that up to National and EU level government all of whom are filled with unwanted NGOs. Is it any wonder that people feel as though they are there just to provide a cushy life for a group of people who are meant to be on their side. Labour moved right and bled votes. There is nobody for the left to vote for. That’s only going to be fixed at this point by moving to a PR-based voting system for Westminster. The UKIP is a symptom of cyclic tendencies in UK politics, no more. The real issue is the number of people who don’t have a party to vote for because there’s been rightward movement from Labour. And I have to disagree on France – the problem there was that he didn’t carry through with policies of the left which he absolutely was in a position to deliver. Tories, harder or anti-poor centralists? Wuh? Many of the people who voted LibDem in 2010 are likely never, ever going to vote again, sadly. When you’re as far right as you, no surprise they all look the same. No surprise you oppose democracy either. Unwanted NGO’s. Oh, people get helped. You’re lashing out because poverty isn’t bad enough, basically. If they feel let down, they should vote for another party to punish the Lib Dems. By the way, how is first past the post better than alternative vote? Neither is a proportional system and changing to AV would not have reduced the chances of changing to PR in the future. Why? They wanted leftist policies, the LibDems promised then backstabbed them from their PoV. There’s no party offering anything remotely leftist now, and even if they were why would they trust them again? And the math of it. AV can potentially deliver even less representative results than FPTP, and there are times where it likely *would* (“landslide” votes) in British electoral history! AV/IRV also does not provide, as FPTP does, success when testing (in electoral math!) consistency, monotonicity, participation and reverse symmetry. There’s also evidence from i.e. Australia that it leads to convergence between party’s platforms – an issue we already have, and I don’t want to see it become even worse! I also disagree, it’s “we already changed”, but sure that’s an argument both ways. I just think it’s more convincing this way, because there was (again) 2:1 support for MMP over AV when that was an option in polling! The party is utterly irrelevant. The LibLabCon establishment are fundamentally the same – pro-EU, high tax, big State, pro-immigration, etc. No, we need a smaller government in westminister. We have too much centralisation. …how dare they! All the same! Right. Less welfare. Less healthcare. Less rights. More powers for right wing councils to criminalise homelessness, etc. No problem. Electoral study and math is strongly related to Game Theory, which I use professionally, and I’m interested in. How do you work out that Gary Scott is opposed to democracy? Which reminds me of the ” Game Theory” discussed by Nick Cohen in his excellent ” What’s Left”. A couple of researchers invented a game theory by an equally mythical professor and tested it on various academics who all said that it was a useful tool to them in their particular fields. It was a “Kings New Clothes” situation. The world is full of sycophants and nowhere more so than in academia. That reminds me, I must retrieve my copy of ” What’s Left”, absolutely brilliant. Some of the Quango Kings/Queens move from one tax paid for position to another on a Golden handshake merry-go-round – that’s really helping the poor, isn’t it. Unaccountable, unelected, and having access to the tax payers pockets – Democratic??? People are being deliberately disenfranchised – policy is being set by NGOs. No wonder the people are cynical. In the UK the population of all ages and income level have lost any concept of what government and politicians are for. All with or without money do not watch politicians on TV or read about them in newspapers. News in general is not watched. Let alone a party political broadcast. The word politician gives an image of someone saying economical untruths, being in the role for their own personal greed and being a remote aristocratic elite. The UK is not in a democracy and never has been, with the existence of the unelected upper house of parliament called the House of Lords. Democracy is from the Greek inventors of people voted government, and means Demos – the people and cracy, the state. In others words, the government is the people. That occurs nowhere. Explain to me, please, why Labour is a carbon copy of Tories? Why Labour could even gain 41 new seats in England or Wales in 2015, using the Scottish Labour MPs, with the loss of a Free Scotland forever escaping Tory rule, when Scottish parliament never votes in a Tory administration? – equalise state pension for men at 60 in 2015. – universal non-means tested Citizen Income, non-withdrawable, in or out of work. Ye..no. Game Theory is a branch of mathematics. Keep making excuses for your dislike for democracy. As you spam extremist site links. And the Greens admit that they’d then take that back from the poor with a LVT and energy pricing, leaving the poor screwed. Ah yes, blame those nasty people who work for things like the meat hygiene board, no need for them at all! You defend the unelexcted, unaccouintable, taxpayer-cash rich CEO’s, rather than people appointed and accountable to government, on far lower salaries than your beloved CEO’s. It’s anti-democratic class warfare from you. YOU are trying to disenfranchise people based on lies. You’re a bit sad, aren’t you – but let’s go through it, shall we. “meat hygiene board” – doing a worthwhile job. “defend the unelexcted (sic) unaccouintable (sic) taxpayer-cash rich CEO’s (sic)” – the same CEOs that I condemned in my original comment. “It’s anti-democratic class warfare” – I’m on the bottom rung sunshine, and I’ll check my privilege against yours anytime – so don’t throw your class crap at me, it won’t wash. The virtual removal of unions from the private sector working environment has eliminated the link between Labour and the people it was supposed to represent and draw many of it’s candidates from. With this ‘shop floor’ avenue into politics removed it’s hardly surprising that a political class has rapidly formed of law and politics graduates with the right qualifications and contacts but remarkably homogeneous backgrounds and viewpoints. Politics is again a game for those wealthy enough to play. So… because I refuse to condemn democracy and support useful government functions, I’m a “bit sad”. You admit you hate and want to attack people doing a worthwhile job, right, no surprise there. You are indeed bottom-rung, you’re a Capitalist Banker, with your nose in the air, lording it over us and not noticing the smell of ****. You’re really Newsbot9 aren’t you – he/she/it used to talk utter shite like you. Can’t you get yourself a girlfriend or something. Look, LordBlagger, just because you want to murder British workers and oppose education for the 99% is no reason for you to get all huffy and be completely unable to defend the argument. So, to recap; You cannot refute that you’re anti-democratic,hate and want to attack people doing a worthwhile job, and are a bottom-rung stuck-up Capitalist Banker. Nah – shorts and T shirt man me. So, to recap, you are for unelected, unaccountable, and greedy CEOs and Directors being put in positions of power on our councils, creating and imposing policies that nobody has voted for, selling and outsourcing our services, selling our cities for the profit of a small number of onside councillors and their cronies, and completely disenfranchising the people of those cities. I’ve always felt that you Common Purpose types would be more at home in the Conservative Free Masons. 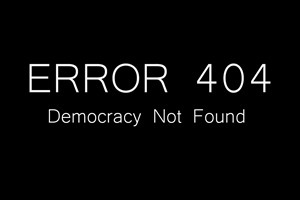 Anti-democratic – better have a look in the mirror sunshine.